Uhhh, irgendwie hat das wehgetan als ich bei einer Galerie in den Flur geschaut habe. Auch wenn die Platten wahrscheinlich nicht wirklich gut waren, sind es immer noch Platten! Und so mit Vinyl umzugehen, tut mir halt weh…. Scheint ein Kunstwerk von Sol Aramendi zu sein, was ich da vor mir hatte und vom Eingang aus abgelichtet habe, irgendwo in Manhattan – New York. this hurts! 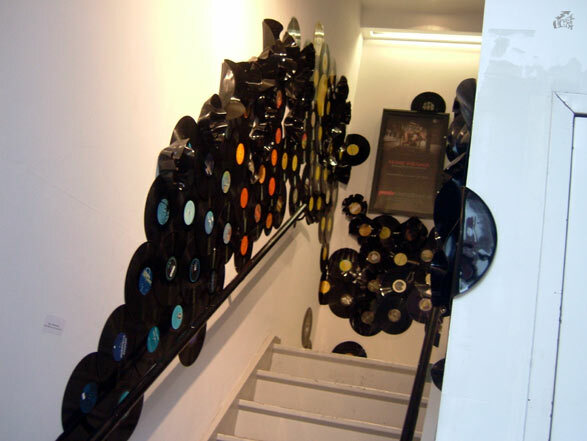 When I was around in Manhattan – New York I took a look at an entrance from a gallery and I could see lots of vinyl. Although I guess these records are/were not really good, they are still records. And seeing all these vinyl like this; just hurts me somehow. Now I found out, it is art from Sol Aramendi what I have photographed from the doorstep. I hope you are doing well. Someone send me this link about my work. And I wanted to tell you that I am a vinyl advocate as an artist I created many many projects that made people go back or start listening vinyl. I work with all ages and I have a project called Vinyl Social. The vinyl that I use in my installation are damaged and that they cannot be recycled, they are provided by the record presser Brooklyn phono. Long live to the vinyl. Let me know when you are back in NY and you can stop by in my studio.